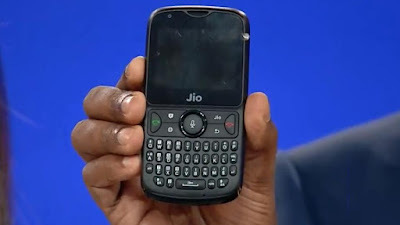 Jio Phone 2, the successors of Jio Phone was launched by the Reliance Industries Limited chairman and managing director Mukesh Ambani on July 5, 2018. The Jio Phone 2 is expected to hit the market by August 16, 2018. The company has set the starting price of the phone at Rs 2,999. The Jio Phone 2 comes with a 2.40-inch display and a screen resolution of 240 pixels by 320 pixels. The phone has a 512 MB of RAM and 4GB of internal storage that can be expanded up to 128 GB via an SD card. It has a 2-megapixel primary camera on the rear and a 0.3-megapixel front shooter for selfies. It runs on KAI operating system and is powered by a 2000mAh battery. The connectivity options available on Jio Phone 2 includes - Wi-Fi, Global Positioning System (GPS), Bluetooth, Near-field communication (NFC) and frequency modulation (FM). The new JioPhone 2 is strikingly different from its predecessor in terms of design. JioPhone 2 has a QWERTY keypad now along with a 4-way navigation pad. While the form factor is different now, JioPhone 2 and JioPhone have the same 2.4-inch display. JioPhone 2 comes with the same camera configurations as the JioPhone. This includes a 2-megapixel camera at the rear and a 0.3-megapixel (VGA) camera up front. Both phones are capable of video recording. In terms of connectivity, JioPhone 2 offers new options like dual SIM support and VoWi-Fi. Rest of the features remain same like 4G VoLTE support, FM radio, Bluetooth, Wi-Fi, GPS and NFC. On the software front, both phones run KaiOS, and are fuelled by a 2,000mAh battery. In terms of memory, JioPhone 2 comes with the same capacity of 512MB of RAM and 4GB of internal storage. There’s a microSD card slot for further expansion up to 128GB. JioPhone and JioPhone 2 both come with access to JioApps like MyJio, JioMusic, JioTV and more. JioPhone 2 has amped things up with support for popular social apps like Facebook, YouTube and WhatsApp. The company has announced support for these apps to JioPhone as well. JioPhone is priced at Rs 1,500 (refundable after three years), while the JioPhone 2 will be available at a higher price of Rs 2,999. Reliance Jio is likely to announce a similar refundable scheme with the newer model as well.